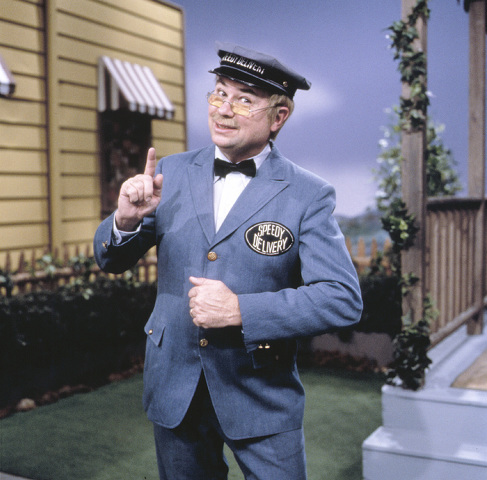 Mr. McFeely, played by David Newell, was the postman on the long-running PBS show "Mister Roger’s Neighborhood." He will be in Bellefonte on March 24 to help dedicate a new stamp commemorating the 50th anniversary of the television series. BELLEFONTE — "Mister Rogers’ Neighborhood" is coming to our neighborhood. It’s sure to be a beautiful day when the neighborhood from the groundbreaking children’s television show will be the theme for an afternoon of children’s activities. The special day will include a very special guest — Mr. McFeely, who was the postman on the PBS show, currently celebrating its 50th anniversary. The American Philatelic Society and WPSU-TV, State College public television, invite the public to meet at the American Philatelic Center, 100 Match Factory Place, Bellefonte, to celebrate "Mister Rogers’ Neighborhood" and a new stamp issued in honor of Fred Rogers. Activities for the whole family will take place from 2 to 4 p.m. Saturday, March 24. The event occurs the day after the new "Mister Rogers" forever postage stamp will be formally released in Pittsburgh, where Rogers produced and filmed the show. The series ran for more than 30 years on PBS. Mr. McFeely — the postman from the Speedy Delivery Service portrayed by David Newell — will be in character. He will arrive aboard the Penn State trolley and invite everyone inside the building, where at 2:15 p.m. he will dedicate the new Mister Rogers stamp as it becomes part of the American Philatelic Center’s collection. He will then visit with children and sign autographs. Other planned activities include an opportunity for children younger than 12 to color a design on an envelope, address it to someone special, affix a stamp to the envelope and mail it. The APS, through its historic Headsville Post Office, will have Mister Rogers stamps available for purchase. WPSU will bring its cutout trolley, reminiscent of the Mister Rogers’ Neighborhood Trolley, to be used as a backdrop for photos. Daniel Tiger, the star of the animated "Mister Rogers" spinoff show "Daniel Tiger's Neighborhood," also will be present via a life-size cutout. WPSU will hand out "Daniel Tiger’s Neighborhood" activity booklets and coloring sheets to children 8 and younger. The APS Education Department also will offer stamp-collecting activities, including an opportunity for children to create their own free stamp albums. Clips of "Mister Rogers' Neighborhood" will be shown during the event and tours of the American Philatelic Center will be available.